Paul Rushton and Lee Piatt of the Firm’s Business and Finance Department will serve on the newly formed Closely-Held Business Committee of the Section on Business Law of the Pennsylvania Bar Association and Paul will serve as the initial Chair of such Committee. The purpose of the Committee is to assist Pennsylvania practitioners in providing advice concerning business and finance issues that frequently affect closely-held businesses. To learn more about the Firm’s Business & Finance Department, please click here. Paul’s contact information can be referenced here and Lee’s contact information can be found here. On Thursday, September 13, 2018, Jim Valentine, Chair of the Labor and Employment Law Practice Group, along with Kimberly Wylam of Baker Tilly Vantagen, made presentations to regional family-owned businesses at Penn State Scranton and Wilkes University on the topic of Sexual Harassment Awareness: Myths & Reality. This seminar was sponsored by the Family Business Alliance of Wilkes University/Penn State Scranton. Specific matters covered in the presentations included: What is unlawful sexual harassment; what are the ramifications of the #METOO environment; and, what is the impact of social media and millennial attitudes in the workplace? 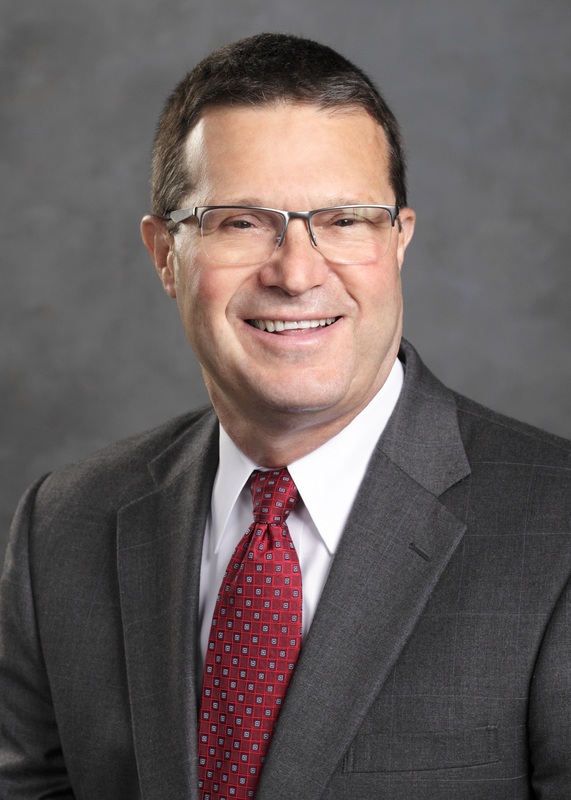 Click here to learn more about Attorney Jim Valentine. An article prepared by Paul Rushton, the Chair of the Firm’s Business & Finance Department, was recently published in the Times Leader 2018 Attorney Guide. The article, titled “No More Excuses – Changes to Pennsylvania Associations Code and Realty Transfer Tax Rules Eliminate Justifications for Continued Ownership of Real Estate through General Partnerships”, outlines the reasons why general partners should consider the conversion of their real estate holding general partnerships into a limited liability entity. Paul’s article previously appeared in a Pennsylvania Bar Association Business Law Section newsletter. Please contact Paul if you have any questions about this subject. Paul’s contact information can be found here. Articles prepared by attorneys from the Firm’s Business & Finance Department were published in the most recent Pennsylvania Bar Association Business Law Section newsletter. The newsletter can be viewed here. 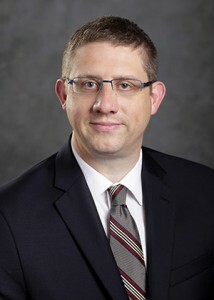 Lee Piatt’s article titled “Capitalize the Single-Member LLC” identifies practice tips for properly capitalizing and structuring a Pennsylvania limited liability company that is owned by only one member. The article illustrates how such steps can be used to bolster the limited liability protection afforded to the single owner of a Pennsylvania limited liability company. An article prepared by Paul Rushton describes how certain changes to the Pennsylvania Associations Code and Realty Transfer Tax Rules have eliminated the justifications for continued ownership of real estate through general partnerships. Paul’s article explains that it is now increasingly advisable for general partners to consider the potential conversion of their real estate holding general partnerships into a form of entity that affords limited liability protection. If you have any questions about these articles, please feel free to contact Lee or Paul. Lee’s contact information can be found here and Paul’s contact information can be referenced here. To learn more about the firms Business & Finance Department please click here. Rosenn, Jenkins & Greenwald, LLP presented a seminar at the THINK Center in downtown Wilkes-Barre. 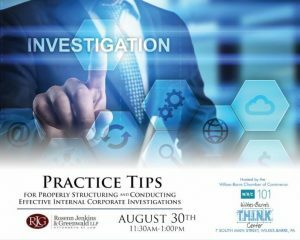 Attorneys from Rosenn, Jenkins & Greenwald, LLP presented a seminar titled “Practice Tips for Properly Structuring and Conducting Effective Internal Corporate Investigations” at the THINK Center in downtown Wilkes-Barre. The presentation described the increased usage of internal corporate investigations in recent years by management and legal counsel for organizations to identify and address corporate malfeasance or other wrongdoing in the board room or the workplace. The presentation outlined the investigative process that is typically utilized for such purpose and suggested tips for properly structuring and conducting an effective internal corporate investigation. The presenting attorneys included: Paul Rushton, the Chair of the firm’s Business and Finance Department; James Valentine, the Chair of the firm’s Labor Department; and Michael Sowinski, a former Luzerne County Assistant District Attorney and a member of the firm’s Litigation Department. A video of the presentation is available on the Greater Wilkes-Barre Chamber of Commerce facebook page and can be found here. We are proud to announce that Atty. Rick Russo, the Chairman of our Firm’s Personal Injury Practice, has been named a 2018 Super Lawyer in the field of Personal Injury. In addition to Super Lawyers, Rick also has been selected by his peers for inclusion in the 2018 Edition of The Best Lawyers in America in the area of Plaintiffs Personal Injury Litigation. Atty. Russo handles a wide variety of serious injury claims in Northeast Pennsylvania, including tractor-trailer, bus, auto and motorcycle accidents; injuries caused by drunk drivers; and injuries caused by landowner neglect. When you need a bodily injury attorney, please contact Atty. Russo directly at (570) 826-5650 or email him at rrusso@rjglaw.com. He has a proven record of success for more than 30 years. Richard A. Russo, the Chairman of Rosenn Jenkins & Greenwald’s personal injury practice, recently attended the American Association for Justice (AAJ) 2017 Convention in Boston. Each year, AAJ Conventions bring together thousands of America’s leading attorneys who handle traumatic injury cases for their clients. The annual conference spans several days and provides unique opportunities for accomplished lawyers to meet with other lawyers and experts from across the country and discuss new developments and ideas to better represent their injury clients. The conference also provides lawyers with numerous continuing legal education programs covering a wide array of topics that are important to their area of practice. To read more about AAJ click here.